Ashley Park House has a magical quality that is particularly appealing. The avenue winds along the shore, through deep woods of oak and beech, until–suddenly–you reach the Georgian house, surrounded by tall trees, with beautiful views over a private lake. Inside, the rooms are large, comfortable and well equipped. The owners, Margaret Mounsey and her father Sean, run their home in a relaxed and informal way, which makes it ideal for family visits. Outside, guests like nothing more than losing themselves in the woods and gardens, or rowing around the lake and exploring the ruins of the ancient fort on the island. Ashley Park House sits peacefully in the middle of 76 acres of beech woodland and formal gardens in the heart of County Tipperary, six miles north of the busy market town of Nenagh with its famous circular keep, on the road to Borrisokane and Birr. This beautiful 18th century country house, with its sweeping Edwardian verandas overlooking the lake, is approached through a rusticated stone arch, down a long tree-lined avenue with lovely views across Lough Ourna (‘the lake of the barley’), framed by ancient ring-forts on the shore, towards Keeper Hill in the distance. Ashley Park House was purchased by Sean Mounsey and his wife about twenty years ago; Sean still lives in the house and runs it with their daughter Margaret. 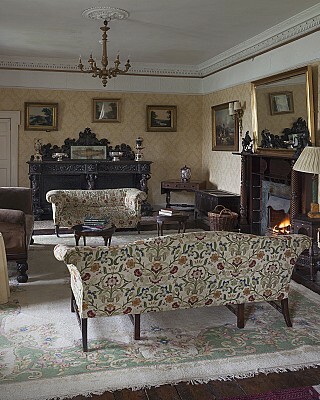 The house retains many of its original Georgian fittings and has been faithfully restored to its original appearance, with fine period furniture and all modern comforts, giving visitors the opportunity to appreciate truly authentic Irish country house accommodation. The main rooms are spacious and relaxing, while the large bedrooms either overlook the lake in front, or have views over a series of walled courtyards at the rear where there are hens, ducks and peafowl. Guests are encouraged to wander through the walled gardens, along walks leading through fairy forts, beneath 300 year old trees, past the gazebo and the gardener’s cottage, to pick fruit from the orchard. Or they can borrow a boat and row around the lake, perhaps trying their hand at fly fishing for trout or visiting the ruins of the fort on the island. In the immediate area there are golf courses at Nenagh and Roscrea, fly fishing for trout on Lough Derg and wonderful hill walking in the Devil’s Bit and Silvermines Mountains. Ashley Park House is a true Hidden Ireland experience right in the heart of the Irish countryside. Ashley Park House is a peaceful haven on the edge of Lough Ourna , and if you are looking for a beautiful venue, steeped in character offering quality, style and attentive service in the tradition of the Irish country house then it is the perfect setting for your perfect day. Set in 76 acres of beech woodland and formal gardens, the historic country house giving a very beautiful backdrop for your wedding photos, surrounded by beach woodlands and gazing over the lake. With an excellent reputation for hosting weddings over the past 15 years at Ashley Park House we host weddings as if they were for our own family. We recently featured the shoot in One Fab Day, also they are doing a Part 2 of the shoot in the next few weeks so keep your eyes peeled for this.